or the closest thing anyway! 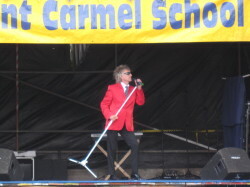 In previous years Mount Carmel's Summer Fair has had Elvis wowing the crowd, this year, it was the turn of that gravelly voiced rocker Rod Stewart. And wow he certainly did. 'Rod' aka Gary Pease from Walsall performed two fab sets to a packed house of parents, children and friends of Mount Carmel on Little Ealing Lane. 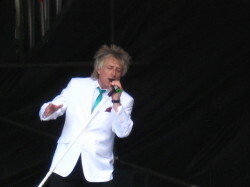 He made sure to sing all the favourites, hits ranging from Maggie May and Hot Legs to Glad Rags and Sailing. Gary took great delight in getting the audience to sing-a-long with these classics. 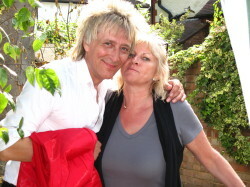 My sister - a serious Rod fan- has just been to see the main man at the O2 arena spending £75. She proclaimed that the £2 entrance fee to see this Rod was money well spent and he was 'just as good'... high praise indeed. The packed audience at Mount Carmel had enjoyed great weather for the 12-6pm summer fair which raises thousands for the school every year. By the end everyone was in great spirits, dancing in the aisles and screaming for more. Gary was an excellent entertainer and absolutely ideal for this gig. Move over Rod ...you have competition of a serious nature.